BAKER, Walter Campbell Age 84 of Hillside Pines Home for Special Care, Bridgewater, and formerly of Little Liscomb, Guysborough County, passed away Monday, April 1, 2019. Born in Antigonish, he was a son of the late Archibald and Janette (Dingle) Baker. He was the last surviving member of his immediate family. Walter was a member of the former St. John’s United Church, Liscomb. He was a commercial fisherman for 40 years who also worked during the off-season as a pulp cutter for 35 of those years, and worked for the Canadian Coast Guard for a short time. He enjoyed playing cards and Bingo. Walter is survived by sons, Calvin (Linda), Dayspring; Archie, Pugwash; Vernon, Waterville; daughters, Joyce Baker (Warren), Liscomb; Beatrice (James) Johnson, Bedford; grandson, Edward Blake (Crystal) Baker; sister-in-law, Lauretta Baker, Sherbrooke; numerous nieces and nephews, cousins and their families. He was predeceased by his wife, Joan Barbara (Wilkie); son, Edward James Baker; one daughter in infancy; brothers, Burnham, Clarence, Maxwell, William; sisters, Marjorie Croft, Helen Ellis, Eliza Creaser; grandchildren, Tyler Baker and Stephanie Baker. Cremation has taken place. A graveside service will be held April 20, 2019 at 1:00 P.M. in St. John’s Cemetery, Liscomb with Rev. Derek Elsworth officiating. Memorial donations may be made to St. Mary’s Memorial Hospital, Sherbrooke. Arrangements are under the dignified and compassionate care of G.W. Giffin Funeral Home, St. Mary’s Chapel, 34 Main Street, Sherbrooke. On-line condolences may be made at www.gwgiffin.com. 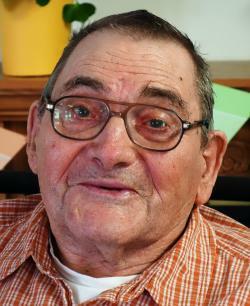 Walter's family would like to thank the staff of Hillside Pines Home for the kindness, compation and care given to him.